TODD SPARROW has been a long time coming. 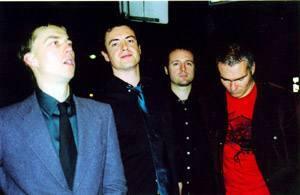 The first version of the Sydney- based quartet was formed in 2001 by songwriter ROB GIBSON who had played in a handful of small bands over the years, most notably COWSPANKER. He teamed with drummer NICK KENNEDY, known for his work in BIG HEAVY STUFF and more recently THE COPS, and began writing and recording material at home. Gibson didn't think too much would happen with the songs but then they collared guitarist and producer DAVID TRUMPMANIS , which spelt the start of Todd Sparrow's debut album. ``We started moving really quickly once David came into the picture,'' Gibson said. ``After we started recording, we still didn't really know what was going to happen. But we've got quite a definite sound and direction for a group of guys who didn't really have an agenda.'' With the addition of Kennedy's fellow Big Heavy Stuff member, bassist ELLIOT FISH, the future of Todd Sparrow began to look even more promising. The aptly titled Here's to the Start of Something Beautiful was released in September and spawned the TRIPLE J staple, Enough About Me. lw3 It is a particularly exciting time for Gibson who, unlike the remaining members of the group, has never embarked on a major tour. ``We didn't really know where we were going at first but now we've got an album out, we feel like a proper band so it's kind of turned into a bit of a reality for us,'' Gibson said. ``I'm a tour virgin so it's gonna be awesome.'' Todd Sparrow will play their first show in Newcastle at the NORTHERN STAR HOTEL tomorrow night supporting THE RED RIDERS and THE COPS.